Here's a story. On the afternoon of Friday, November 21, 2008, an email bearing the subject header "confidential information" turned up in Gawker's tips inbox. The sender's email address was "harveydent701@yahoo.com," a dummy account. The only text in the email itself was "please consider the attached information." Attached was a Microsoft Word document with the filename "MediaMogul.doc." 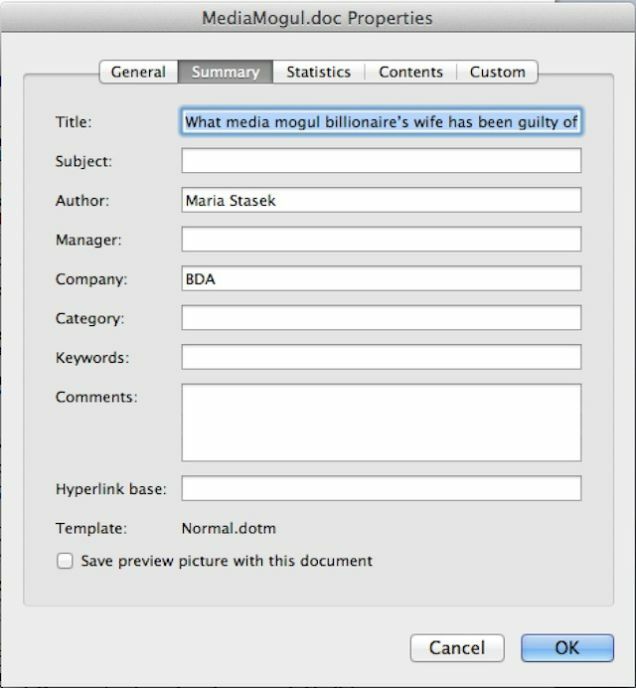 The Word document began: "What media mogul billionaire's wife has been guilty of so many sexual escapades that she is the talk of LA?" 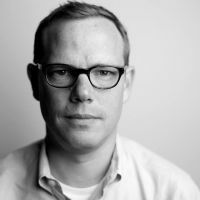 It went on to claim that Wendi Deng, the then-wife of Rupert Murdoch, was a "vicious...hustler," "licentious...whore," and "nymphomaniac" whose whose "path to [Murdoch's] board room and bed room is paved with betrayal, infidelity, adultery and continuous scandalous affairs." While it didn't directly name any men Deng was alleged to be carrying on with, the document said "the mogul's wife is having an affair with an executive from the media moguls own company." At the time, rumors were swirling in New York media circles about Deng's alleged infidelities, specifically about a purported relationship with MySpace co-founder Chris DeWolfe, whose company Murdoch had bought in 2005 in a $580 million deal that turned out to be as catastrophically ill-considered as his marriage to Deng. And of course, Deng and Murdoch's marriage did eventually fall apart last year amid another round of rumors about Deng's relationship with Murdoch's waterboy, former British Prime Minister Tony Blair. People Are Googling "Wendi Deng Tony Blair"
Gawker's then-editor Gabriel Snyder mentioned the tip—and a number of other unsolicited rumors about Deng that had been sent our way—a few days later in an item wondering, "Who's Behind the Campaign to Smear Wendi Deng?" Who's Behind the Campaign to Smear Wendi Deng Murdoch? Palace intrigue was beginning to brew throughout the House of Murdoch at the time the dirt was circulating. The vaunted MySpace deal was quickly becoming a turd, the economy was tanking around him, and Barack Obama had just been elected over loud protestations from Fox News. Tidbits from The Man Who Owns the News, Michael Wolff's biography of him, were just beginning to surface, including claims that Murdoch was "embarrassed" by Fox News' festival of white rage, which Murdoch hotly denied. On November 20, 2008, right as an excerpt from the book was hitting stands in Vanity Fair and the day before the Deng tip came in, News Corp. conspicuously announced that Ailes was re-upping his contract at Fox News. The struggles around Murdoch would only intensify over the next few years: There was the unresolved issue of whether Chloe and Grace, Rupert and Wendi's two young daughters, would be read into the trust that would govern the disposition of News Corp. after Rupert's demise; there was Ailes publicly feuding with Matthew Freud, the husband of Murdoch's daughter Elisabeth, who was openly outraged at Fox News' oversteps; there were Ailes' knife-fights with the other Murdoch kids, Lachlan and James, his rivals for their father's attention; there were the departures of messaging guru Gary Ginsberg and then News Corp. president Peter Chernin, both seen as scalps won by Ailes in his effort to consolidate power. Of course, Deng was herself another power center within Murdoch's sphere. So who was spreading dirt about her? Maria Stasek runs an online clothing business in New York. But for several years, including 2008, when the tip was sent, she was an office manager for Beau Dietl & Associates, a private investigations firm run by former NYPD cop Richard "Bo" Dietl. Its initials are "BDA." 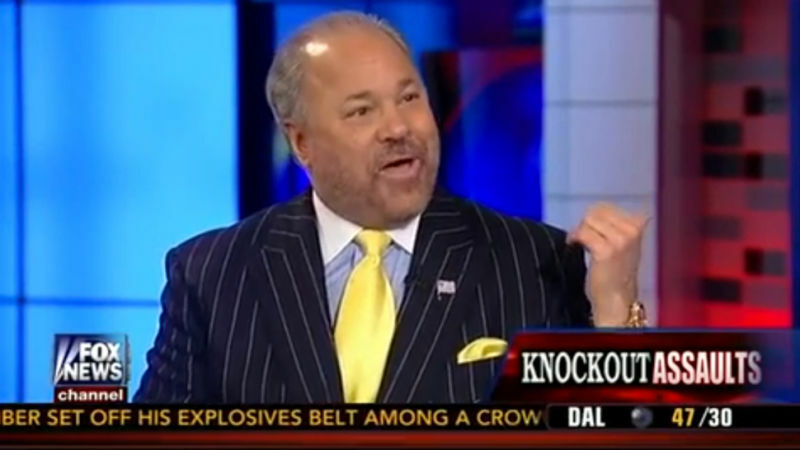 You may recognize Bo Dietl from one of his many appearances on Fox News, where he is a contributor. When I called Stasek to ask whether she had authored the tip, and if she had done so on behalf of a client of Dietl's, she wouldn't say much. "Wendi Deng? Who? Didn't they get divorced, Murdoch and this girl?" She declined to say anything else on the record, but she did confirm that she managed the office at Dietl's firm, a job that included purchasing office software, which could explain why her name was in the document's metadata. At first, Dietl shrugged off the news that someone from his firm had been trashing the owner of the cable news network that pays him. "I know Murdoch," he told me. "I know Roger. I'm a very loyal Fox guy. I would never take a case to hurt them." He told me that Stasek had been fired years ago, and suggested that she had authored the tip without his knowledge or authorization. If that were the case—that a low-level staffer in a connected firm slipped us some good gossip anonymously—then it's not something I'd be interested in writing about on the site. We like low-lever staffers who slip is gossip anonymously, and we preserve their anonymity. But this tip didn't read like a note slipped over the transom—it had the character of a dossier, a detailed and fairly lengthy run-down of Deng's behavior ("Wendi Deng was born 1969 in china and has 2 sisters and one brother," etc.). The kind of thing someone might hire a private investigator to produce. And discreetly distribute. So was Dietl, the "very loyal Fox guy," the actual source of the attack on Murdoch's wife? I called Stasek back to make sure that this was work product. She wouldn't speak on the record, but she angrily denied being involved and told me that she had been in touch with Dietl. Minutes after I hung up with her, I got a call from Dietl, who was angry, too. In the course of our conversation, the investigator took back his initial claim of non-involvement. Dietl confirmed that he had, indeed, been hired to spread dirt on Deng. He wouldn't say who it was, but he did say who it wasn't. "It was not Roger Ailes who hired me to look into Wendi and Rupert," he told me. He also told me that he had been in touch with Fox News' vice president for legal affairs, Diane Brandi. O'Reilly hired the celebrity private investigator Bo Dietl. Sources with damaging anecdotes were tracked down. "This could be a message to people," Dietl said on MSNBC on the evening of October 15. "When you file these frivolous lawsuits...we're going to investigate you and we're going to uncover things." Fox had a crucial ally in the war over O'Reilly: Murdoch's New York Post. On October 15, the front-page headline blared "EXCLUSIVE: O'Reilly Accuser in Bar Blow Up." 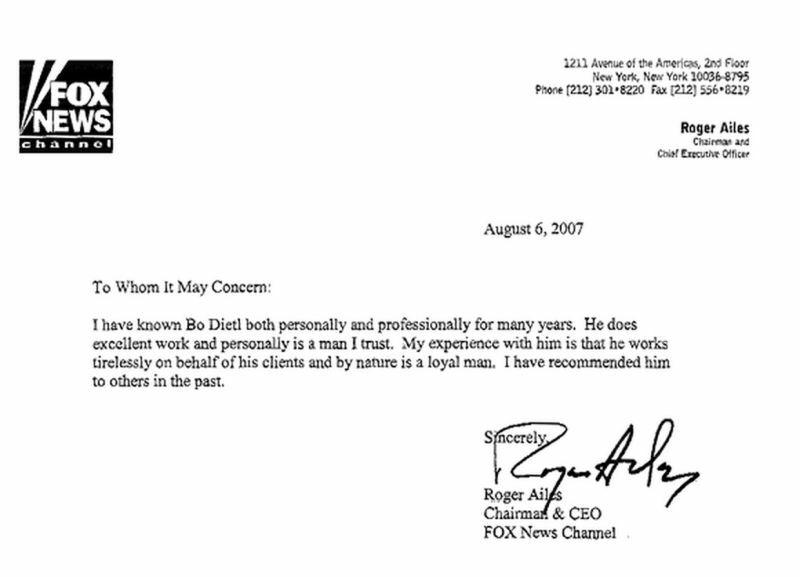 Dietl's web site boasts a personal letter of endorsement from Ailes himself, written in 2007, in which Ailes describes knowing Dietl "personally and professionally for many years" and praising his loyalty and "tireles[s] work on behalf of his clients." If Ailes ever had an interest in driving a wedge between his boss and the new wife who was rapidly becoming a rival in the News Corp. power structure, Dietl would have been a tactful and effective man to turn to for the job. And if it wasn't Ailes who hired him, then Dietl is perhaps not as loyal a friend as Roger thinks he is.